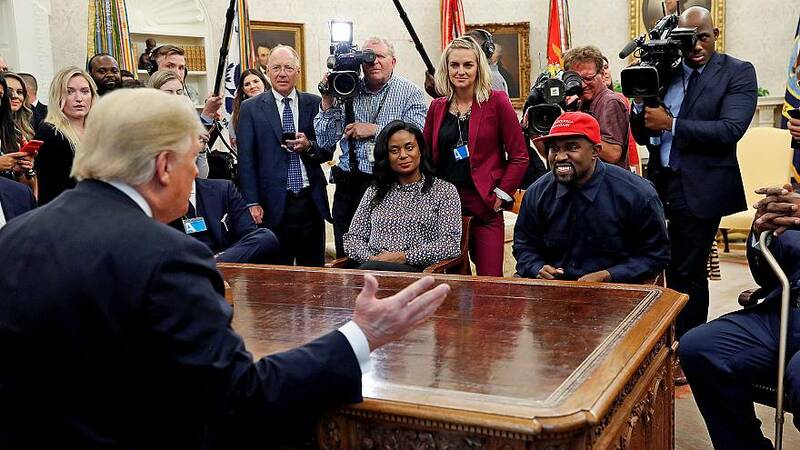 Kanye West made an abrupt turnaround from politics on Tuesday, tweeting that his "eyes are now wide open" and "now realize I've been used to spread messages I don't believe in. He added: "I am distancing myself from politics and completely focusing on being creative !!!" West's decision to back away from the political realm came just weeks after his wild Oval Office meeting with President Donald Trump. Seated across the Resolute Desk from Trump at an event that was supposed to focus on prison reform, West — wearing a red "Make America Great Again" hat — delivered a rambling 10-minute speech touching on abolishing the 13th Amendment, gun violence, and his battle with bipolar disorder, among a number of other topics. One of the comments in his remarks that gained attention was when the rap mogul said 2016 Democratic presidential nominee Hillary Clinton's slogan "I'm With Her" didn't make him feel like a man in the same way Trump's campaign messaging did. "The campaign 'I'm with her' just didn't make me feel, as a guy that didn't get to see my dad all the time, like a guy that could play catch with his son," he said. "It was something about when I put this hat on, it made me feel like Superman. You made a Superman cape for me." The president called West's speech "pretty impressive." "He's a smart cookie," Trump said. "He gets it." West had worn the "MAGA" had and spoken positively of Trump in the months leading up to the meeting, which garnered the president's attention and praise.